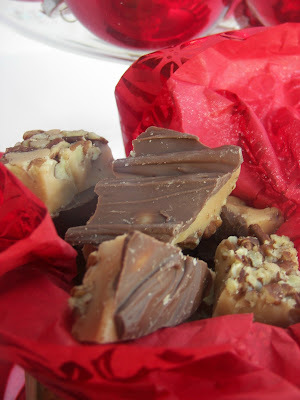 Welcome to Red Couch Recipes! I am sure that you know someone who has been naughty and not nice this year -- I know a few deserving people. Luckily, you don't have to live in a coal-rich area like I do to give them some coal! 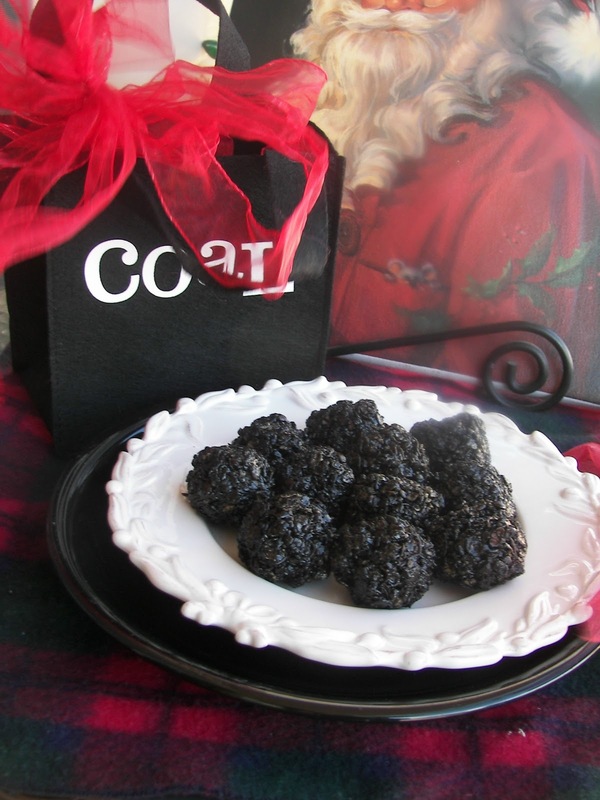 In case Santa might make a mistake and forget to give them coal, you can make some "coal" up in a jiffy! I saw this idea on Pinterest and thought it would be so cute. 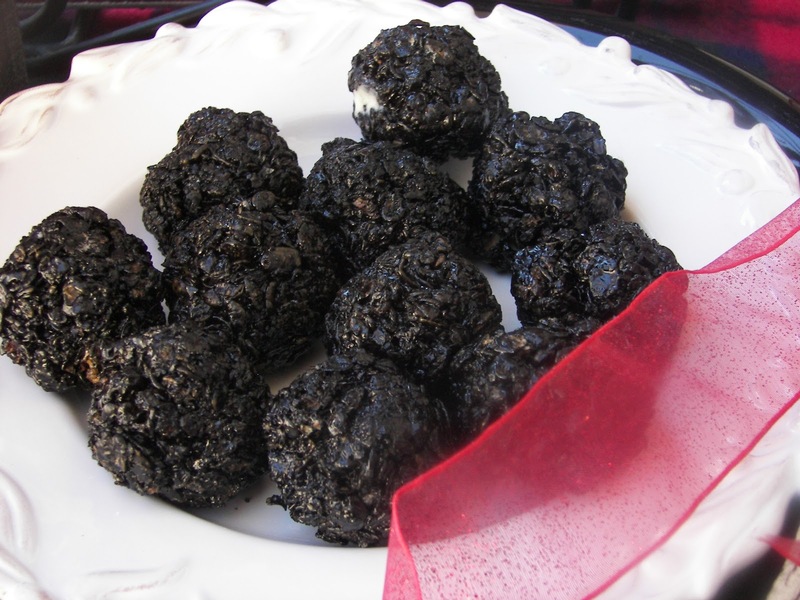 Just make your recipe for Rice Krispies and add some black food coloring and roll into "Coal Balls." We used Cocoa Pebbles, so we wouldn't have to use so much black food coloring ;). In case you don't have a recipe for Rice Krispies, here is one. Prepared buttered 13 x 9 pan and set aside. In a large sauce pan, melt the butter, then add the marshmallows, stirring until they are melted and incorporated into the butter. Add Rice Krispies or Cocoa Pebbles to the marshmallow mixture and mix well with a long handled spoon. Add small amount of black food coloring, then mix well. Add more if needed. Put Rice Krispie mixture into pan and allow to cool. Put buttered baggies on your hands to avoid staining and form into balls. Cute idea, Joni:) Merry Christmas! 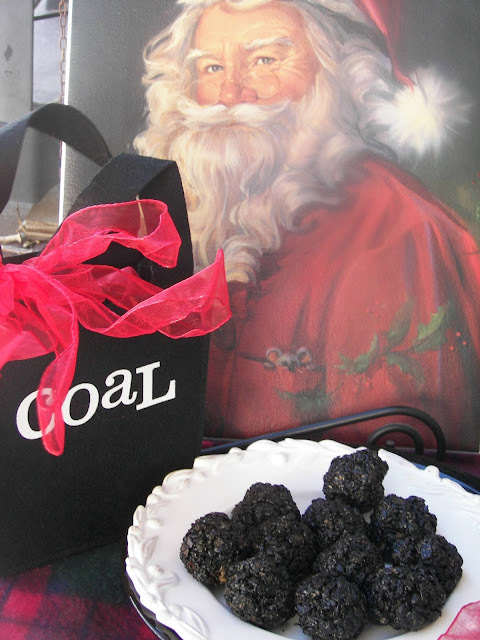 Oh dear - I'll bet that there are children who would be very well-behaved if faced with the possibility of getting coal in their stockings - that is, until they have a taste of this coal! That is the cutest idea! I guess you buy black food coloring right there with the rest of them? I know someone this would completely delight. So cute! I sure do know someone who deserves coal, and not the delicious kind you made! Very cute idea, Joni! I want to wish you and your family a very Merry Christmas - and hopefully the only coal they'll find in their stockings is the Rice Krispies coal! So Cute Joni. Great idea to use the Cocoa Pebbles. Merry Christmas. Yes, we know some who could use just a touch of coal. What a fun neighbor gift too! I just something similar on the Six Sisters blog and thought how cute. I love your version with the cereal even better! 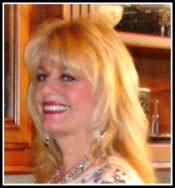 Merry Christmas to you and your family, Joni!